Image courtesy of Trip Advisor. The scientific name of the common city pigeon is Columba livia, but most people just call pigeons rats with wings. This hasn’t always been the case. Sociologist Colin Jerolmack’s research suggests that, once upon a time, these birds were not only appreciated, but also protected by urban dwellers, particularly those who lived in New York City. Jerolmack bases his assertion on a systematic study of every single New York Times article from the paper’s publication in 1851 up through 2006. He found that, over time, the feelings towards pigeons in the articles and editorials that mentioned them steadily shifted from positive to negative as urban life became more distinct from rural living. As New York City’s population grew, so too did the need to provide inhabitants with a sense that nature and its untidiness was “out there.” Hence, Jerolmack writes, pigeons came “to represent the antithesis of the ideal metropolis, which is orderly and sanitized, with nature subdued and compartmentalized” into parks, zoos, and arboretums. As our idealization of what was “urban” grew into something separate from what was “rural,” pigeons became interlopers from the natural world, even to the point where feeding them in public and private green spaces has now become illegal in some parts of the city. But is this fair? Is it right to penalize pigeons for thriving in a situation they didn't create? The now ubiquitous pigeon is not native to these shores. It was brought to North America from Europe in the early 1600s. Images of the bird in Mesopotamian cuneiform tablets and Egyptian hieroglyphics suggested that their roots as a domesticated species extend back roughly 5,000 years, a relationship so old that it obscures ornithologists’ ability to determine where the birds’ original range actually was. People and pigeons have peacefully coexisted for so long that no one can remember exactly when this relationship started. Yet the USDA’s Wildlife Services division recommend that up to 9,000 of NYC’s pigeons be eradicated as “nuisance animals” in 2005. You wouldn't expect creatures that fly to fall from grace. Recently, I came across another rural trespasser in an unlikely urban setting that got me thinking about pigeons and other so-called “nuisance” or “invasive” species. This past July, my wife and I honeymooned in Barcelona, Spain. As we strolled through Parc de la Ciutadella and headed towards the Arco de Triunfo on the afternoon of our arrival, we heard a series of sharp “squawks” pierce the din of the bike riders, bubble blowers, and bocci players. I looked up through the sunlight into a nearby palm tree, and saw a brilliant peridot-plumed bird peering out from one of many narrow openings in a tangle of twigs and other urban detritus (as if it were looking for whatever it was that made that loud human noise). The bird, I would learn, was a Myiopsitta monachus, or Monk Parakeet. Like pigeons, Monk Parakeets – also called Quaker Parrots – are considered another interloping species that refuse to know their place. And, like pigeons, this South American bird is not responsible for its unlikely presence in places like Barcelona, or the Home Counties of Great Britain, or in Stratford, Connecticut, or in Brooklyn, New York. This beautiful, highly social bird is labelled an “invasive species” in all of these places, but to describe the Monk Parakeet as such is, I think, erroneous. To call something an “invader” implies that what has been so labelled maliciously chose to occupy someplace. This just isn’t the case with the Monk Parakeet. At the risk of over-anthropomorphizing, there simply was no Pearl Harbor for them. No one can recall a day where clouds of birds descended from above, blocking out the sun as “Ride of the Valkyries” played in the background. Nor has their presence in Brooklyn, or any of the other far-flung areas they’ve established themselves, been attributed to some drastic climate shift that has forced the species to search for more hospitable environments. It is true that the first Monk Parakeets in US airspace did fly here. In planes. New York’s Monk Parakeets are thought to be descendants from birds who escaped damaged shipping crates at Kennedy Airport in the 1960s. At the time, Monk Parakeets were aggressively exported to all parts of the world as pets in an attempt to mitigate crop damage they were causing in their native Argentina. This man-made relocation strategy is consistent with the logic behind Jerolmack’s theory about pigeons – that as people began to redefine and repurpose the environment (in this case a rural one), what makes a species’ presence either good or bad can change. And, like pigeons, the Monk Parakeet’s ability to adapt and flourish to their changing environment by appropriating crops for food and nesting material wasn’t admired, but punished. The birds were exported so heavily that, in addition to the locations previously named, escaped Monk Parakeets have been able to establish colonies in Italy, Belgium, Israel, Chicago, Cincinnati, Florida, Wisconsin, New Jersey, and Rhode Island. That’s a lot of broken crates. The new scenery hasn’t completely benefited the Monk Parakeet, nor erased its status as a “nuisance.” In the absence of suitable trees, Monk Parakeets have been known to build their massive condo-like nests, which can weigh up to 200 pounds, on utility poles. When these nests become big enough to link live wires, the lines – and at times the transformers – short out, which results in lost power and lost profits. A September 2014 study conducted by researchers at the University of Connecticut found that a colony of Monk Parakeets in Florida “caused 198 power outages in one five month period, leaving 10,000 people without power.” The same study found that Florida utilities removed more than 3,000 nests in a five-year span, at a cost of some $4.7 million dollars. So while some people, like Brooklyn’s Steve Baldwin, who leads tour groups to nesting sites in Flatbush find the birds to be a welcome sight in a drab urban landscape, authorities often disagree. Various national and local government bodies throughout the world have – at the very least – banned the import of Monk Parakeets, with others going so far as to aggressively seek the bird’s eradication. And yet, new feral populations pop-up, just as old colonies rebuild. For now, this is a battle the Monk Parakeet seems to be winning. The bird’s ability to survive and thrive in places like Barcelona and Florida makes some sense, given that these areas have climates that are not too dissimilar from Argentina. But how have Monk Parakeets been able to thrive for over 50 years in places like New York – where winter temperatures run an average of 15-20 degrees lower than in Argentina. Jerolmack’s theory, which explains the role of space in defining any particular animal as a nuisance, can’t really help us here. He’s a sociologist, and as such, he approaches the presence of nuisance animals from the perspective of one trying to understand a social problem, not determine how pigeons or parakeets make a space work for them biologically. That’s where behavioral flexibility comes in. In 2010, a team of biologists determined that “successful invasive species possess attributes that enable them to adapt and exploit key resources in the non-native range.” Behavioral flexibility suggests that when a non-native species attempts to establish itself in a new environment, it will change its behavior the way we might change clothes, until it finds a behavioral variant that literally works for the weather. Monk Parakeets have something else in common with pigeons: they are not picky eaters – a trait that serves them well where ever they land – but they are choosy about where they eat. For Monk Parakeets, who utilize the same nests year round, this means building nests in utility poles because, not only are they sturdy, but they provide a source or warmth, especially during the cold winter months. This is a perfect example of behavioral flexibility in action. For Charles Darwin, pigeons were no rats with wings. He revered the bird for it’s vast diversity, so much that he kept a dovecote on his estate. Darwin became fascinated by a breeder’s ability to manipulate the species’ appearance by selectively breeding birds with the desired traits. His own experiments with pigeons greatly informed much of his work on evolution, as he came to see breeders like himself as stand-ins for what nature just does on its own. Today, biologists are returning to Darwin’s pigeons, and with the aid of DNA sequencing are about to confirm a theory that Darwin could only suspect to be true: that all modern pigeon breeds (and there’s a lot) descend from Columba livia, the common, pesky pigeon. It’s ironic that, during his famous voyage on the H.M.S. Beagle, Charles Darwin helped to solidify the Monk Parakeet’s status as a nuisance animal in its native land by observing how the birds “commit great ravages on the corn-fields” of South America. He didn’t know it then, but Darwin was planting the seeds of a practice that, in a way also gives weight to his theory of evolution, and that parallels his work with pigeons. A century later, after attempts to control the Monk Parakeet through eradication had failed, the Argentine government turned to exportation as a way to mitigate the problem they posed. 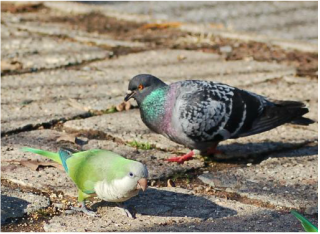 In so doing, they gave the Monk Parakeet a chance to evolve by forcing it to select those behaviors that would, like the pigeon that came before it, ensure its survival as a stranger in a strange land. Header art by T. Guzzio. Original photo by Tamara K. via Wikimedia Commons. In addition to editing Prodigal's Chair, Tom is a teacher, father, husband, writer, artist, futbol fan and slightly maladjusted optimist. He lives in Beverly, Massachusetts with his wife and their cocker spaniel, Honey (who approves this message). You can connect with him on Twitter @t_guzzio, or via email at tom@prodigalschair.com. At Prodigal's Chair, thoughtful, honest interaction with our readers is important to our site's success. That's why we use Disqus as our comment / moderation system. Yes, you will need to login to leave a comment - with either your existing Facebook, Twitter, or Google+ account - or you can create your own free Disqus account. We do this for a couple of reasons: 1) to discourage trolling, and 2) to discourage spamming. Please note that Disqus will never post anything to your social network accounts unless you authorize it to do so. Finally, if you prefer you can always email comments directly to us by clicking here.